The Siren Song of Dead Bananas – Wait…are those…cookies?! Hmmp. Tis the season, indeed. FOR CAKE! Ha. Prepare yourself. This is only cake one of two. For now, anyway. One never can tell in this household. Wait. Let’s be real. 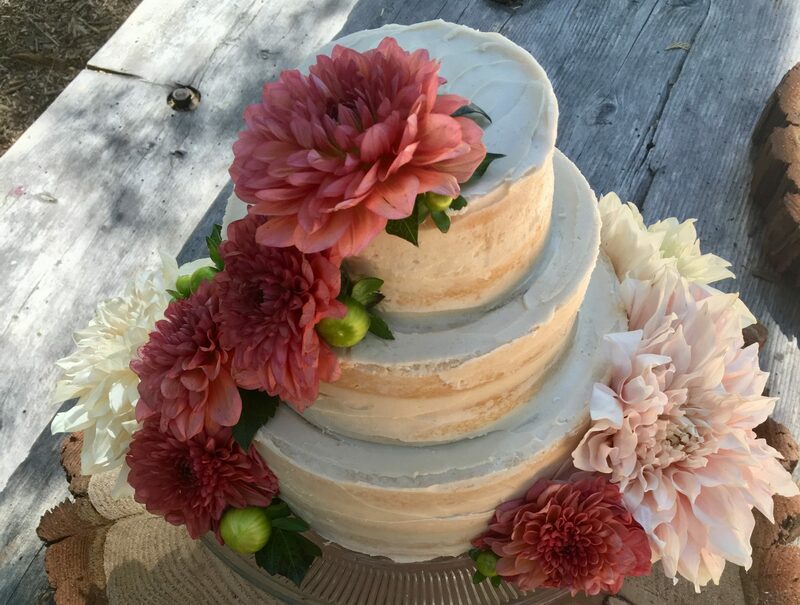 It’s ALWAYS the season for cake! But I have more of an excuse now, hooray! Hehe. Anyway. This cake was supposed to be the dessert for company, but I decided to make it early, because hey, why have one cake when I can have two?! So there you have it. Cake greed and several dead-ish looking bananas won out. Totally not my fault—those bananas were singing their siren song from the counter, looking all dejected and spotty. Like, “Come over and eeeeeaaaat meeeeeeee, I am tastyyyyyyy and fermentedddd!” Well actually, if a banana said that to me, I would a) run screaming out of the house, and b)…yeah. Run screaming. Anyway, these particular bananas didn’t speak to me, thankfully, but notified me via their spottiness that they would prefer to hang with some buttercream in a cake. Of course they would want to go in a cake! I mean, I could have made banana bread, but psshhh really? Why make banana bread when the holiday season gives me the excuse to cover everything that comes out of my oven in buttercream? This particular one was delicious to the max. Banana cardamom for the cake (I love banana cake already, so it wasn’t exactly a hard sell), with browned butter buttercream. WHaaaaattt. Browned butter makes everything so much better. Because there were only three of us, I decided to make a baby cake! 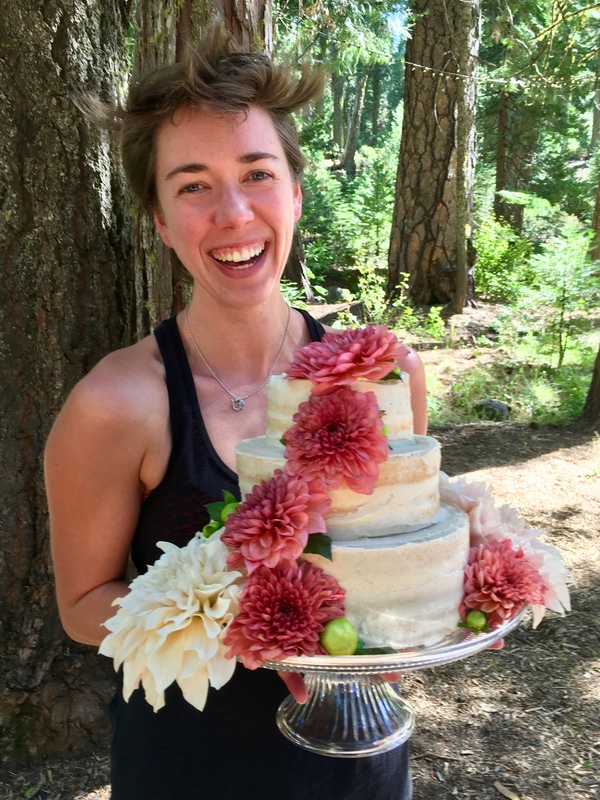 I made half the batch, and then used a glass to cut out three layers from the 9″ cake pan… which of course left cake scraps to be eaten, yesssss! It was adorable, if I do say so. AND delicious. AND I’m on cake-making duty this Wednesday, which is excellent as this one is tragically gone.The more, the merrier! Adapted from here! 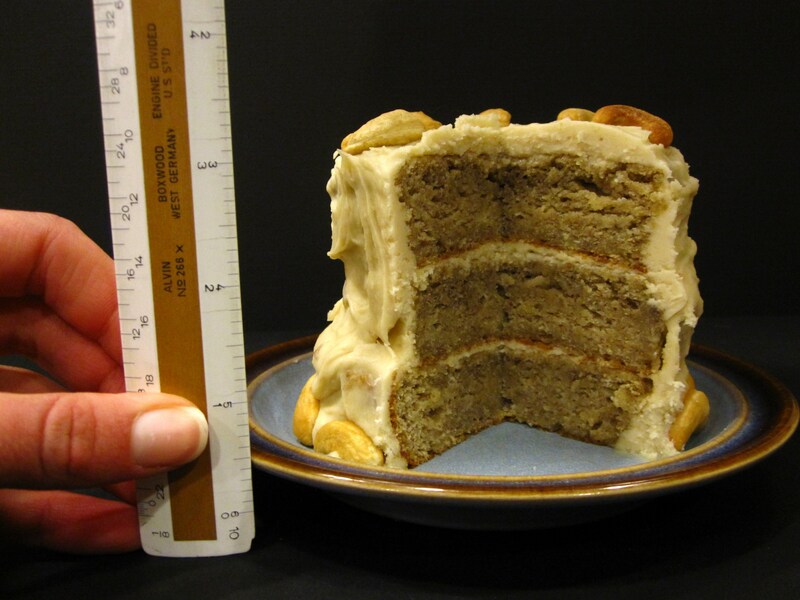 I’m including the full recipe; however, if you want a baby, halvsies cake, make half the cake and half the frosting. I had more than enough to frost the cute little three layer cake, plus the leftover cake pieces. Preheat your oven to 350. Grease and flour your pans of choice, (it would be two 8 or 9″ for a two layer, full recipe), and line the bottom with parchment paper. Whisk together dry ingredients: flour, salt, baking soda, and cardamom. In a large bowl, cream butter until smooth. Beat in sugars until light in color and fluffy. Beat in eggs and vanilla, then yogurt, and then mashed bananas. Without throwing flour everywhere, add in dry ingredients and beat until incorporated. Divide the batter evenly between your prepared pans, and bake for 25-35 minutes. Mine was done more around the 35 minute mark, as it’s dense cake. It wasn’t dry at all though—just perfectly done just shy of 35. Let cool in the pan for 10ish minutes, and then turn out onto cooling racks. While the cake is cooling, brown the butter in a medium saucepan. You’ll know it’s browning, as it starts to turn to an amber color, and smells FANTASTIC. When it’s finished, pour it into the bowl you’re using for frosting—this keeps it from cooking too much more and burning. Whisk in sugar, vanilla, and 3 tbsp of milk, until smooth. Gradually beat in enough milk to take it to a buttercream texture (you’ll know when it gets there—it’s lots thicker and spreadable). Frost cake when its completely cool. 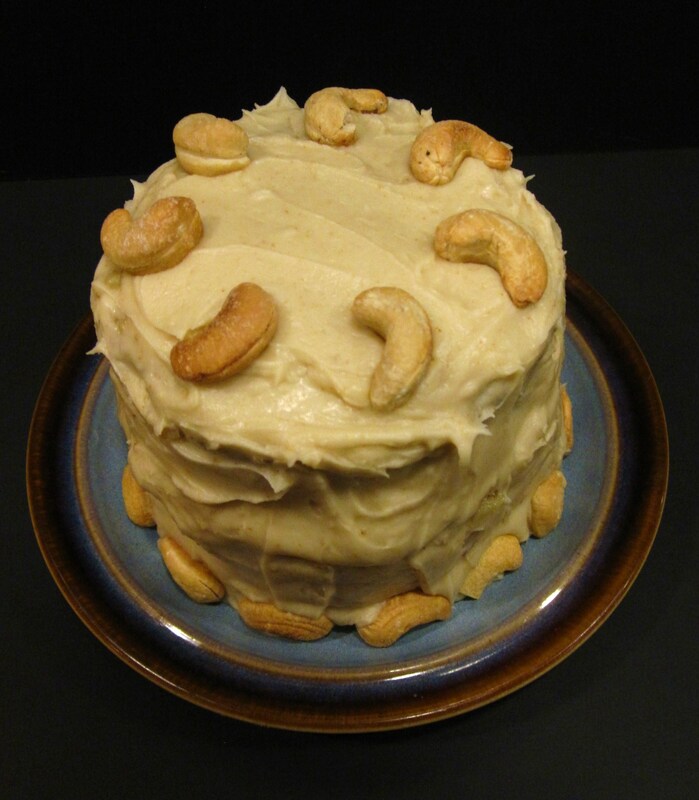 Garnish with toasted cashews and enjoy indulging :) Tis the season! 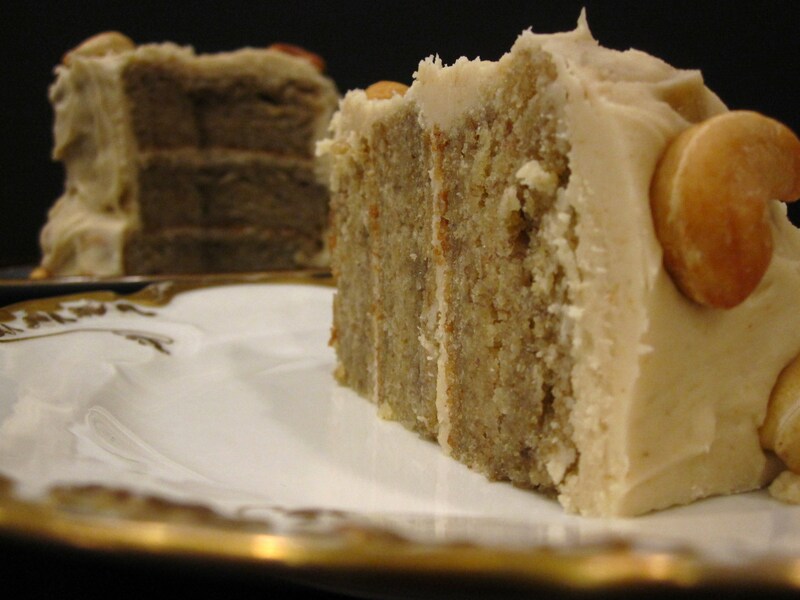 This cake is deeeeelish, especially for anything banana lovers!! 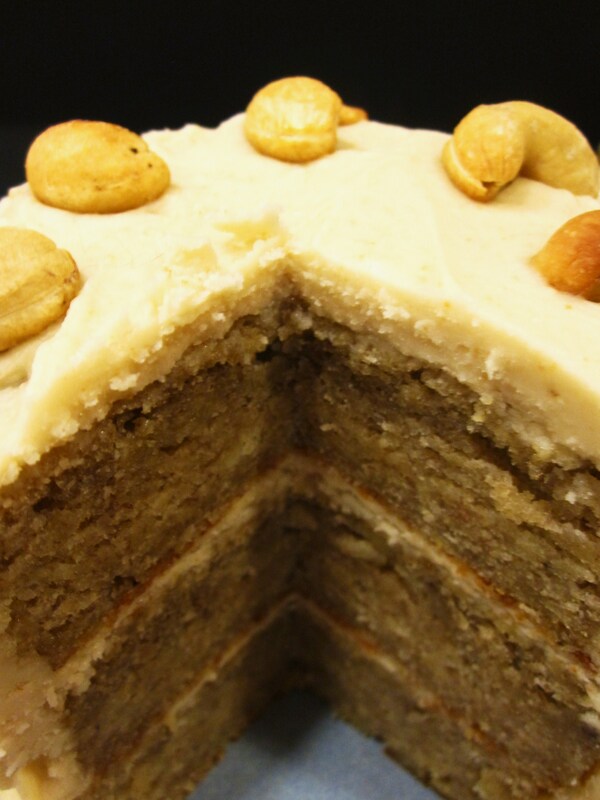 The cardamom really pairs well with the banana and the buttercream making the flavor that much more complex! YUM!! 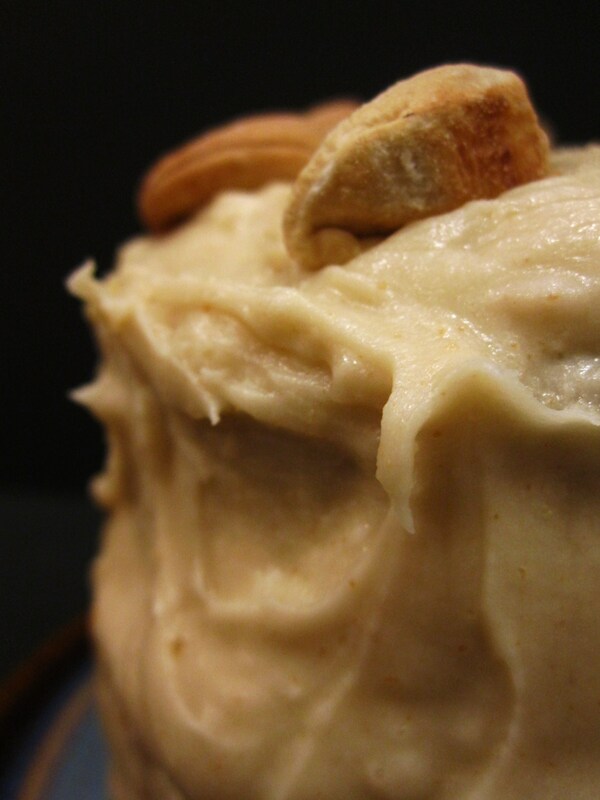 Mmmmmm, buttercream :D. This cake sounds amazing – quite unlike any cake I’ve ever heard of. Hey !! Totally Bananalicious, you Babelicious you! HaHaHa!!! Thanks for sharing the recipe! Happy holidays! Props on the tripple layer madness!! That word butter does imply a certain magical taste factor. But the cardamom absolutely makes it for me!